Sehri, S., Ghayour, H., Amini, K., Rastegari, H. (2015). Investigation of Wear Mechanism in Quenched and Tempered Medium Carbon-High Chromium Martensitic Steel Using Dry Sand/Rubber Wheel. International Journal of Iron & Steel Society of Iran, 12(2), 17-23. S.M. Sehri; H. Ghayour; K. Amini; H. Rastegari. "Investigation of Wear Mechanism in Quenched and Tempered Medium Carbon-High Chromium Martensitic Steel Using Dry Sand/Rubber Wheel". 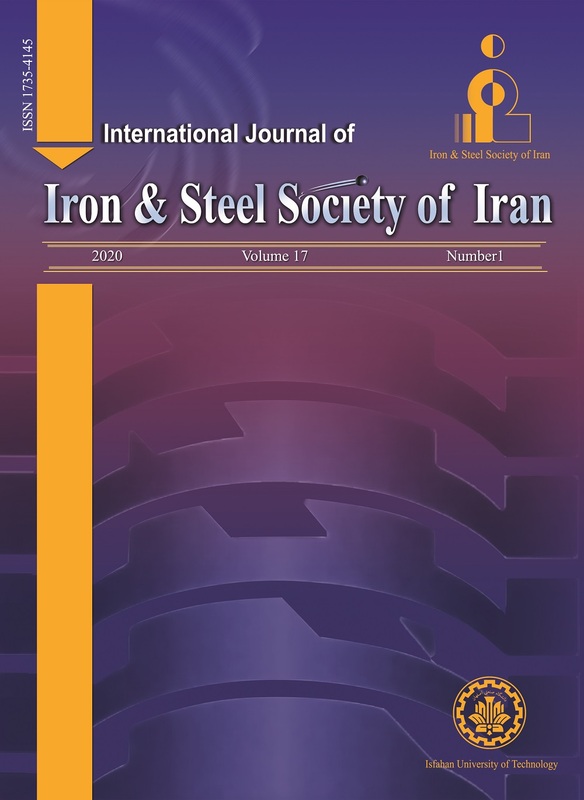 International Journal of Iron & Steel Society of Iran, 12, 2, 2015, 17-23. Sehri, S., Ghayour, H., Amini, K., Rastegari, H. (2015). 'Investigation of Wear Mechanism in Quenched and Tempered Medium Carbon-High Chromium Martensitic Steel Using Dry Sand/Rubber Wheel', International Journal of Iron & Steel Society of Iran, 12(2), pp. 17-23. Sehri, S., Ghayour, H., Amini, K., Rastegari, H. Investigation of Wear Mechanism in Quenched and Tempered Medium Carbon-High Chromium Martensitic Steel Using Dry Sand/Rubber Wheel. International Journal of Iron & Steel Society of Iran, 2015; 12(2): 17-23. The aim of the present study was to investigate the effect of quenching and tempering temperatures on the microstructure, mechanical properties and the wear characteristics of medium carbon-high chromium wear resistant steel. In addition, the dominant wear mechanisms were studied. For this purpose, austenitizing and tempering temperatures were selected in the ranges of 900- 1000 °C and 300- 500 °C, respectively. Mechanical properties were evaluated through hardness and impact tests as well as wear test (by dry sand/rubber wheel apparatus). Microstructure and wear and fracture surface appearances were investigated using scanning electron microscopy (SEM). Moreover, the measurement of retained austenite was done through X-Ray diffraction (XRD) analysis. The obtained results revealed that the best wear properties were achieved by tempering at 450 °C due to the reduction of tendency to micro-cracking, the decrease in internal stresses, and the improvement of the impact energy. Observing the wear surfaces showed that the wear mechanism for the specimen tempered at 400 °C was a combination of abrasive, adhesive and fatigue wear. However, abrasive wear was the only active wear mechanism for the specimen tempered at 450 °C. P.W. Cleary: Minerals Eng., 14(2001), 1295. S. Banisi, M. Hadizadeh: Minerals Eng., 20(2007), 132. ASM Handbook, Heat Treating, Vol. 4, Third Edition, Metal Park, (1995). G. W. Stachowiak, A. Batchelor, Engineering Tribology, (2000). H. J. Yu, S. D. Bhole: Tribology. Int., 23(1990) 309. C. S. Ramesh, S. K. Seshadri, K. J. Lyer: Indian. J. Tech., 29(1991), 179. K. H. ZumGahr, Microstructure and Wear of Materials, Tribology Series, Institute of Materials Technology, Germany, (1987). A. K. Gupta, D. M. Jesudas, P. K. Das, K. Basu: Bio system. Eng., 88(2004), 63. L. Fang, Q. D. Zhou, Y. J. Li: Wear, 151(1991), 313. M. Dollar, I. M. Bernstain, A. W. Thompson: Act. Metal., 36(1988), 311. P. T. Mutton, J. D. Watson: Wear. 48(1978), 385. Z. Q. Jiang, J. M. Du, and X. L. FENG: J. iron steel research. Int., 13(2006), 57. D. L. Albright and D. J. Dunn: JOM. (1990), 23. K. Amini, M. R. Hoda, A. Shafyei: J. Metal Sci. and Heat, 55(2014), 499. A. Nasery Isfahany, H. Saghafian, Gh. Borhani: J. Alloys. Comp., 509(2011),3931. J. Y. Huang, Y. T. Zhu: Mate Sci. Eng. A., 339(2003), 241. Standard Test Method for Measuring Abrasion Using the Dry Sand/Rubber Wheel Apparatus, ASTM International G 65–00a, (2000). G. Krauss, Steels Heat Treatment and Processing Principles, American Society for Metals, (1990). Chen Zhu, Tempering of Engineering Steels, Oxford Materials, (2005). R. C. Thomson, M. K. Miller: Act. Mat., 46(1998), 2203. T. Y. Hsu, Y. Linfah: Material Sci., 18(1983), 3213. K. P. Balan, A. Venugopal Reddy, and D. S. Sarma: J. Mater. Per., 8(1999), 385. A. K. Gupta, D. M. Jesudas, P. K. Das, K. Basu: Bio. Eng., 88(2004), 63. F. Hanguang, X. Qiang, F. Hanfeng: Mate. Sci. Eng.A., 396(2005), 206. L. Bourithisa, G.D. Papadimitrioua, J. Sideris: Tribology Int., 39(2006), 479. A.K. Jha, B.K. Prasad, O.P. Modi, S. Das, A.H. Yegneswaran: Wear, 254(2003), 120. J. Yang, Y. Liu, Z. Ye, D. Yang, S. He: Surf. Coat. Technology, 204(2009), 705. F. Velasco, M. A. Martinez, R. Calabres, A. Bautista and J. Abenojar: Tribology Int., 42(2009), 1192. A. Ben CheikhLarbi, A. Cherif and M. A. Tarres: Wear, 258(2005), 712.